This World Cancer Day, we’re working with nine other charities to unite everyone in a simple but powerful life changing act – wearing a Unity Band® on Saturday 4 February. By joining forces we will make a bigger impact in transforming the lives of millions who are affected by cancer. Cancer Research UK, CLIC Sargent, Movember Foundation, Anthony Nolan, Breast Cancer Care, Breast Cancer Now, Bowel Cancer UK, Children’s Cancer and Leukaemia Group, Marie Curie, The Royal Marsden Cancer Charity are working together to bring the impact of cancer to the forefront of everyone’s minds on World Cancer Day and make a bigger difference. The two week campaign launches today (19 January), and culminates on World Cancer Day, 4 February. 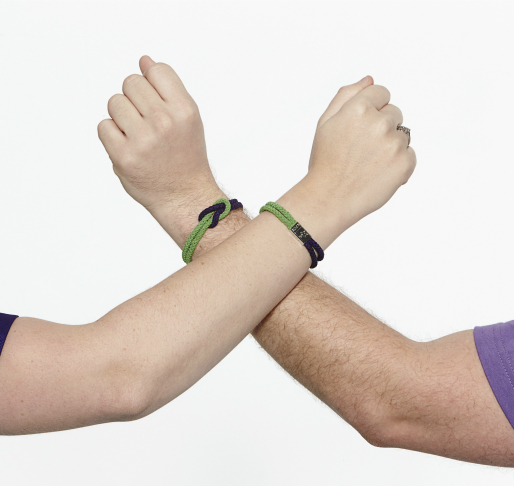 You can get an exclusive green and purple Bowel Cancer UK Unity Band® on our online shop for a suggested donation of £2. Nearly everyone diagnosed at the earliest stage will survive bowel cancer; it’s treatable and curable especially if diagnosed early. But only 15% of cases are diagnosed at stage 1. We’re determined to change this and stop bowel cancer being the second biggest cancer killer in the UK. Our work, like raising awareness of bowel cancer screening, helps ensure more people are diagnosed early and lives are saved. After completing the initial test and returning it, a second one was sent out two weeks later to help confirm findings. John then got a letter from the local hospital. He was booked in for a colonoscopy and a week later he met the consultant. The test came back clear but a nagging doubt in the doctor's mind led to a second colonoscopy carried out by the consultant himself. It was bad news, there were signs of cancer and he was referred for an operation, which saw his entire bowel removed. “It all happened so fast and they had to remove my colon which meant I've had to have a permanent stoma - which isn't really a problem. Fortunately for me it hadn't actually got out of the bowel. But it was that close! My life was hanging by a thread and I didn't know if I was coming out of that operation. That had such a big impact on me and I appreciate just how lucky I was."